Home - Resources for Independent Living, Inc.
Providing services to individuals with severe disabilities, including populations deemed unserved or underserved. Resources for Indep endent Living (R I L) is a community based member organization whose purpose is to serve people with disabilities. 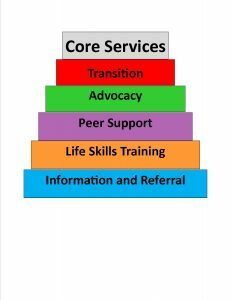 Our core services are Independent living skills training, information and referral, transition, peer support, and advocacy. Membership is open to all people with disabilities, their able-bodied friends, and supporters. We promote personal growth and empowerment through choice, self-determination and participating programs providing information, education, skills development, and networking opportunities. Resources for Independent Living provides people with disabilities the means for self-choice, self-direction, and self-reliance in an inclusive society that offers equal rights and privileges to all. If you would like to become a member please click on membership application tab. You do not need to become a member in order to receive services. If you would like to make a tax deductible donation please on the below donate button.